Landlord Problems? 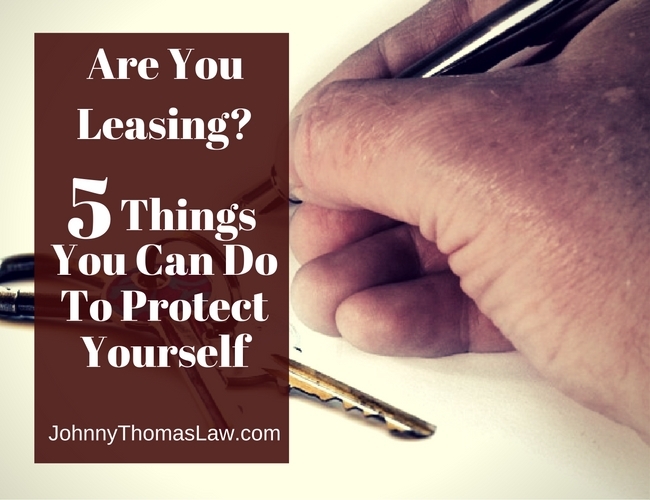 5 Things You Should Be Doing To Protect Yourself In A Lease - Johnny W. Thomas Law Office, P.C. Moving to a new home is an exciting event! For some, the advantages of renting a home have outweighed being tied to a mortgage. Many renters believe that once you have read one lease, you have read them all, right? WRONG. In this article, we share five things you should be doing when leasing property to avoid future problems and unexpected fees. Though Texas property law provides general provisions guiding the tenant-landlord relationship, many of these laws allow for changes or complete elimination in provisions of the lease. It is important to both read and understand any new lease that you sign to make sure you are okay with the rights it gives you and the obligations it can hold you responsible for. Many leases include penalties and additional charges for failure of the tenant to fulfill the obligations in the lease. If you are unsure about a portion of the lease or not in agreement, SPEAK UP. The landlord may be able to explain or even modify the provision to reach an agreement and get you to move in. If you are still unsure, don’t be afraid to consult with an attorney. The fee you pay an attorney now may end up saving you money and headaches later. Nothing puts you at a greater disadvantage to assert your rights in a lease than failing to pay your rent on time. Under Texas law, a lease must provide a date when rent is due and a location for you, the tenant, to pay that rent. When paying your rent, make sure you abide by these rules to avoid future problems. Your lease may provide for a small grace period to pay rent without penalty. Just know, that if you pay rent after the due date, your rent is late, whether there is a penalty or not. Your lease may also state additional rights of the landlord if you fail to pay rent on time. This could include the filing of an eviction, and/or automatic termination of the lease. Generally, Texas law obligates the landlord to make repairs to the property if the damage is beyond the normal wear and tear of property use. However, many tenants can get stuck with the repairs for failure to notify the landlord of the damage within a reasonable time. To avoid this, make sure you notify the landlord of any damage to the property, in writing, as soon as you notice the damage. Also, if the damage is so severe that you cannot use that portion or the entirety of the rental property, a remedy of the law may only be available after the proper written notice is given. At move-in, tenants are generally allowed to inspect the property for any damage. By completing a thorough walk through, where you make sure there is no existing damage and all appliances work, you can make sure that you don’t face responsibility for damage that was already present when you moved in. Many tenants, who fail to conduct a proper move-in inspection, can get charged with extra fees, not covered by the security deposit, at move-out. If you fail to pay these fees, the landlord may have a right to get a judgment against you for the amount. Make sure to check your lease for provisions about overnight house guests and pets. Many leases give landlords the right to charge fees for guests who have become long-term occupants. Once again, if you fail to pay these fees, the landlord may have a right to eviction. You can also be held liable for any damage or harm your houseguest or pet create. If you find yourself in a dispute with your landlord or you facing an eviction suit, please contact an attorney.